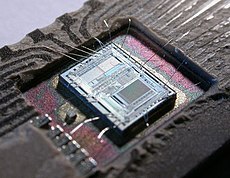 The die frae an Intel 8742, an 8-bit microcontroller that includes a CPU runnin at 12 MHz, 128 bytes o RAM, 2048 bytes o EPROM, an I/O in the same chip. A microcontroller (or MCU for microcontroller unit) is a smaw computer on a single integratit circuit. This page wis last eeditit on 18 October 2017, at 00:19.